Are you the type of person that doesn’t like anything to change? While some people can easily “roll with the punches” some of us find it very difficult to change the way that we do things. The familiar saying that “habits die hard” is very true for many people but this can sometimes causes problems, especially in the workplace. Learning to cope with changes at work can be quite a challenge for some folks, especially those that have been there the longest. 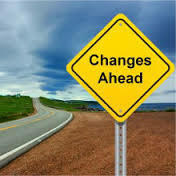 Understanding the reasons for this resistance to change is the first step to helping others cope with the inevitable. Ambiguity – Not completely understanding the reason for a change can cause concern and confusion amongst those affected the most by it. It’s best to explain the reasons why a new rule or policy is being put into effect at work before actually implementing it. In this way people are prepared and understand the reasons behind this decision. Not Being Included – One sure way to insult your staff is to not ask their opinion of something before you make a final decision. Although the decision may be yours, people like to be asked for their input about any decision that will affect their job. Wouldn’t you? Changing Working Relationships Between People – A good organization is comprised of good working relationships between different people. Changing the duties of certain persons will affect the way that team members collaborate with each other and can affect an efficient team. Be careful that any changes you implement don’t disrupt the “natural flow” that exists between key members. Poor Communication about Important Matters – When workers hear rumors (and they do) about a change in pay, different working hours or that “someone” will be leaving soon without any specifics this can cause serious concerns. Does “someone leaving soon” mean that a coworker is about to be fired? Does a “change in pay” indicate a pay cut? The easiest way to avoid unnecessary anxiety on the part of your coworkers is to simply keep them informed. This will stop the rumors dead in their tracks and save everyone a lot of unnecessary angst. Major Changes in Organizational Structure – Obviously any big changes dealing with the elimination of certain positions or the restructuring of positions that may affect an employee’s status within the organization is bound to cause a lot of worry. While this cannot be avoided communication and honesty are the best policy. When the Changes Simply are not Worth the Effort – Asking the entire warehouse staff to move all of the boxes on one side of the wall to another for no apparent reason is not going to win you any popularity contests! Requiring them to work overtime to get it done will hurt the cause even further. Explaining why something needs to be done is important if you want cooperation and rewarding employees for their extra effort will always pay dividends. One thing that will destroy morale in any workplace is additional work without additional benefits for the workers. Keep one thing in mind when making dramatic changes at work that will affect others; it only takes one unwilling person to ruin a good idea. Now that you understand the reasons why change can be difficult for many people you have the tools to make them more comfortable and accepting of what needs to be improved.